We were all young once and have more than likely made a choice or two that we have come to regret. While you may have to live with some of these questionable choices, your tattoo need not be one of them. There are ways of transforming that old tattoo into something new and beautiful. 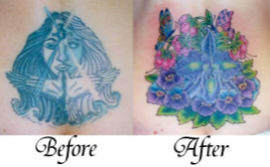 Some tattoos are easier than others to cover depending on the saturation of dark colors, scarring, and overall size. For especially large, dark or difficult pieces we may suggest a session or five of tattoo removal treatment. With laser treatment, you can usually at least lighten old tattoos enough to open up options for the newly improved tattoo. There is definitely a distinct skill to the art of the cover-up tattoo. It would be wise to seek out an artist with both experience and talent. A well-done cover-up will take advantage of the shapes and color density of the existing tattoo to help distract the eye. An experienced artist will draw from said experience and knowledge to give you the best tattoo possible. Almost all cover up appointments will require an initial consultation. During your consultation, we will discuss details and options pertaining to your existing and future tattoo. Ask all your questions and express all your concerns but be flexible with the design, composition and color choices. Your artist will not lead you astray in this decision process.